Gain access to over 130 positive qualities, spiritual powers and metaphysical properties. This is an example of the GEMSTONE REALMS OF INFLUENCE of Lumari's Guide to Crystals and Gems. This section features pages of Attribute words with the gemstones and crystals that hold, attract or impart those qualities and attributes. 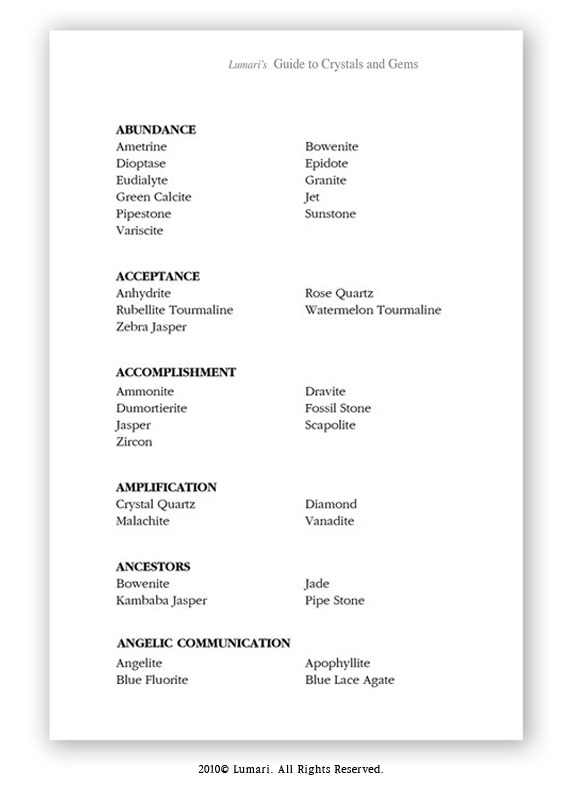 As you can see, one of the Gemstone Attributes listed here is Abundance. The crystals that hold, attract or impart the qualities and attributes of Abundance are listed below that word. Ametrine, Dioptase and Sunstone are some of the gems that contain that attribute. You can just look up the Gemstone Attributes in the book and discover all of the crystals and gems that contain those qualities. There are over 200 Crystals and Gemstones featured in this section alone organized in over 130 properties!